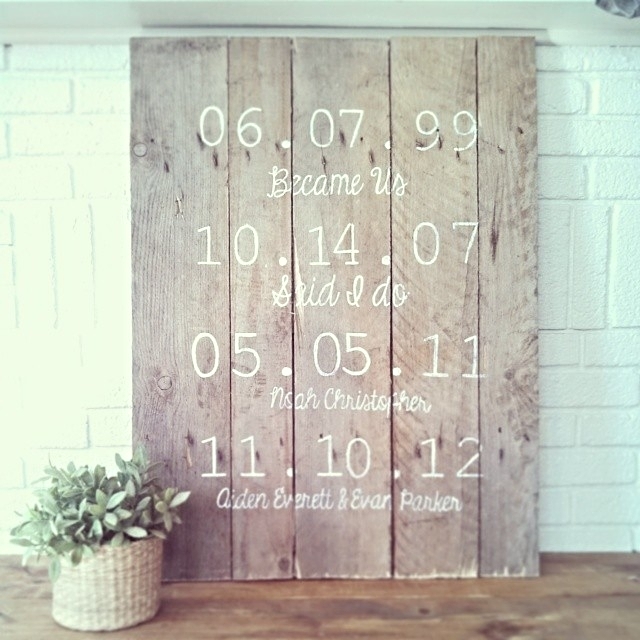 DIY wood pallet important dates or best days of our lives sign. 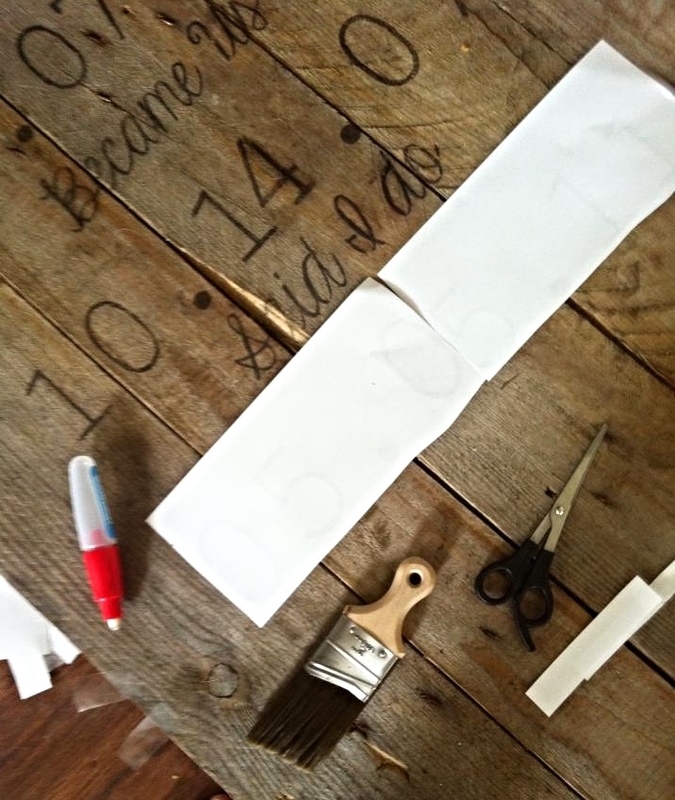 Due to an overwhelming response to my latest DIY project I shared on Facebook and Instagram I wanted to share with you all how easy it is to make your own best days of our lives sign. 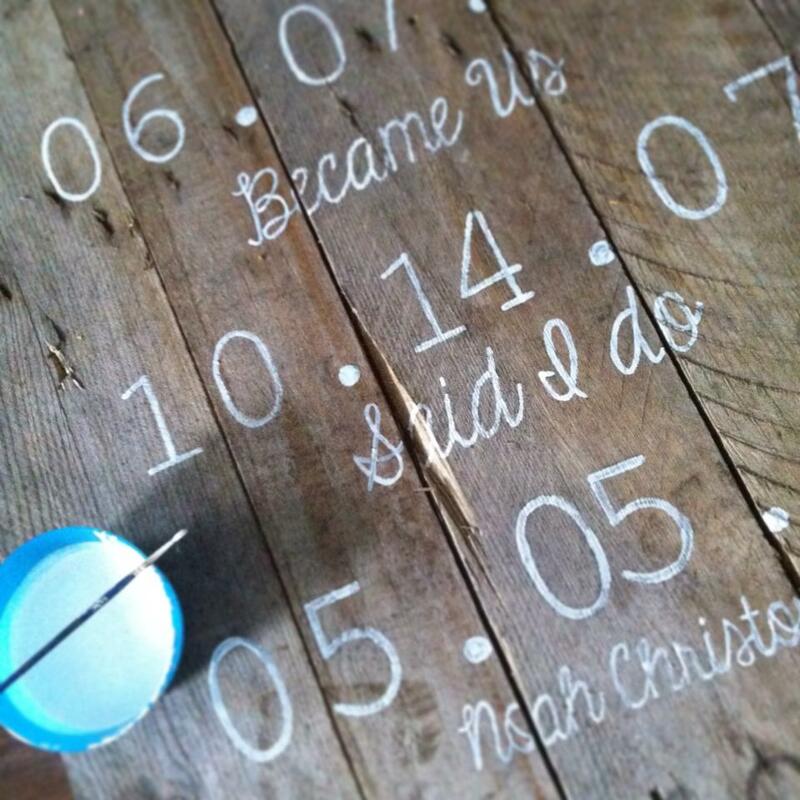 I had seen a lot of important dates signs floating around on Pinterest and Etsy but none of them were exactly what I wanted for the space I had. We have a large area next to our fireplace that needed filed. We already have two gallery walls, so instead of risking the chance of that corner of the living room feeling cluttered I wanted something large but meaningful. I wanted something that would make me smile and make me feel grateful. When I came across the important dates signs I knew that was it. I don’t own a Cricut (as much as I wish I did) and I didn’t want to buy a stencil to do it, nor did I like the look of stencils. So I just kept lusting after all those signs that came through my Pinterest feed…then one day a link to how to transfer ink popped up in my feed with just regular old printer paper and a jet ink printer. My husband knows the way to my heart and luckily he came home that week with a perfect pallet for the project. All the slats were already next to each other and with cutting it down a bit it would be perfect. 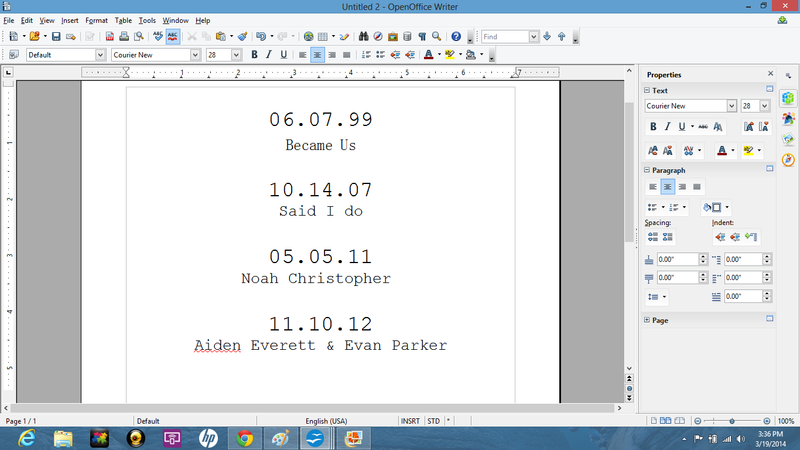 All that I had to do was pick out my fonts, dates, wording and format the printing for the project. The project took me about two hours to complete or in my world 1 extra long miracle triple nap from the boys, plus 30 minutes of patient toddler crafting while I finished it up. First I picked the dates and wording. I started out by making a mock up in Word on my computer. I kept it small at first so I could see the over all look and played with the fonts. I knew I wanted to use something more industrial for the numbers and something that resembled calligraphy for the wording ( I used Courier New for the dates and Eyes Wide Shut for the script). I finally got everything formatted the way I liked it and was ready to print. This step shouldn’t have been as tedious or hard as it was.BUT I have a cheepy ink jet printer…like it costs $20 with the ink in it. 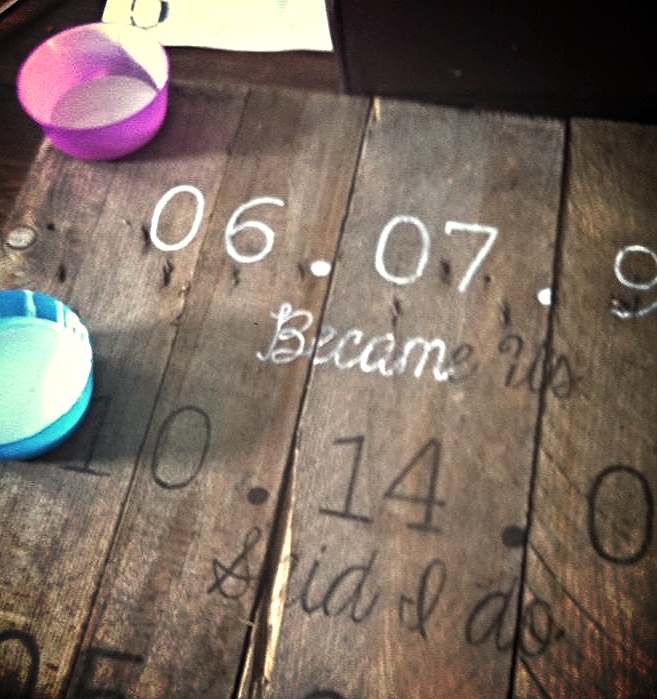 To get the ink to transfer to the wood you have to make sure the ink will be touching the wood…the way you do this is to print the wording in a mirror image. Normally this is just a setting when you go to print and option you can chose in the settings or properties…I was not so lucky. There was no mirror image option. So I busted out my good old MS paint skills. 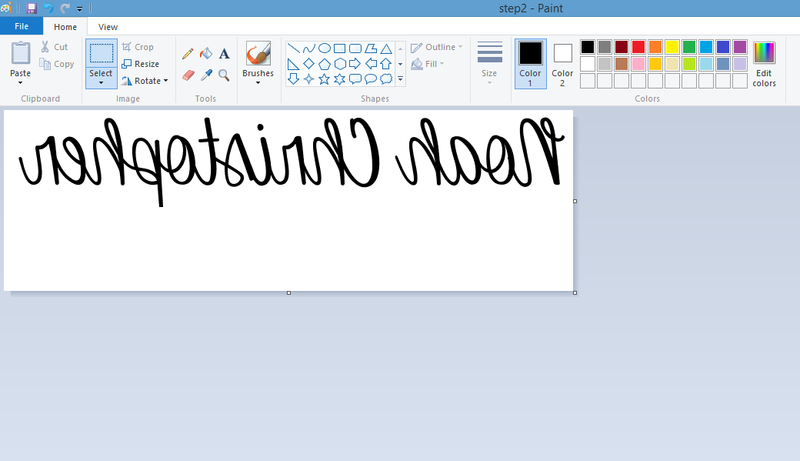 I did screen shots of my font and pasted and cut them in MS paint then used the flip horizontal option under rotate on the tool bar and printed from there. Since I wanted my font to be pretty big (size 300) I had to do it by sections. Once I had it all printed I went about figuring out the placement by laying it all, like a rough draft. Once I figured out my spacing I started the process of transferring. I laid the paper ink side down and used a wet paint brush to dampen the paper. You want to get the paper wet but not soaked enough that the paper will dissolve. Once I wet the section of paper I wanted to start transferring I used the back side of a plastic paint brush to run the ink areas to get the ink to transfer. The ink transfers really well (not to gloss paint or glossy surfaces though!) you can leave it as is (black) or go over it with paint as I did. You just have to make sure to rub all areas of the font, when the paper is wet it is easy to see where the letters and numbers are (that doesn’t show up well in pictures!). I was tempted to leave it black but I thought white would work better with our living room. I just went in with some left over white paint and I had the look I was going for! 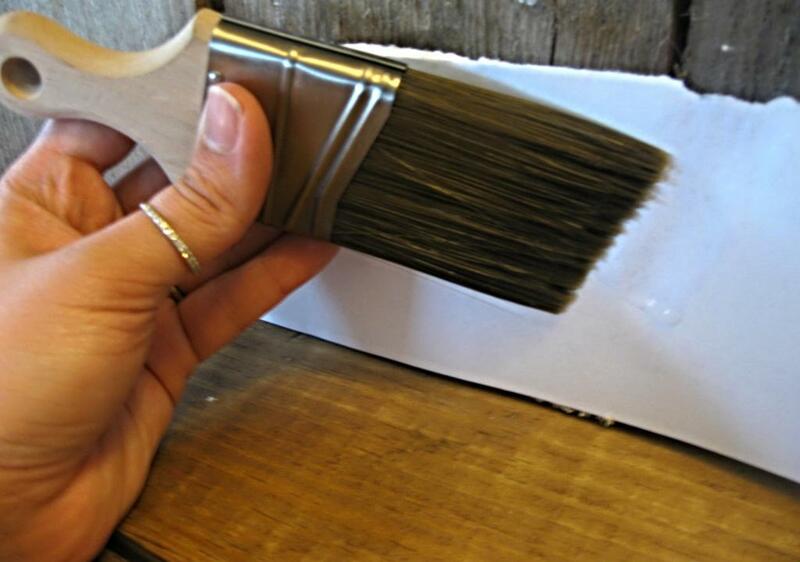 I trimmed down the pallet after the paint dried and that is it! I love that the sign is a constant reminder of how much a day can change your life and I can look and see all the best days of my life and be reminded just how blessed I am! Since this sign is pretty big we haven’t hung it yet, I want to make sure to get anchors but I was eager to share it all with you before! Feel free to reach out if you have any questions and share your signs if you decide to give it a try! !